Greetings again from the darkness. I’m guessing that most anyone who enjoys movies and is at least 30 years old, has vivid recollections of Steven Spielberg’s original Jurassic Park from1993 (based on the Michael Crichton novel). 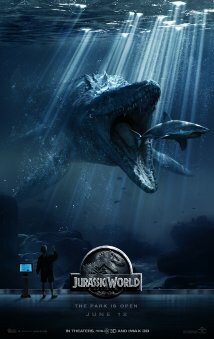 The iconic theme from John Williams, that initial awe-inspiring look at the dinosaurs grazing in the valley, the reminder that “objects are closer than they appear” in side mirrors, and the late Sir Richard Attenborough stating that he “spared no expense” in creating the park … all merged to became part of an incredibly moving and huge new movie theatre experience. This latest (and fourth in the franchise) offers us “big”, but very little “new”, and unfortunately nothing very “moving” in its presentation. Set two decades after the tragic and messy park trial run of that original movie, we find Bryce Dallas Howard (The Help) managing the financially-challenged theme park owned by Irrfan Khan (Life of Pi). Chris Pratt is training Velociraptors, while BD Wong is cooking up hybrid and genetically modified monsters such as Indominus Rex – designed to excite the audiences who have become bored with an old-fashioned T-Rex. Even though this is technically a sequel, there are numerous similarities to the original film, and a fun parlor game consists of spotting all the homage’s and tributes sprinkled throughout. Two of my favorites are the “Winston’s” shop in the park, and the ViewMaster shot early on. These two are tips of the cap to Stan Winston and Ray Harryhausen … two giants in the world of special effects. In what has become the Hollywood “go to” for evil-doers, the secret plan to militarize the dinosaurs is being carried out by Vincent D’Onofrio. Of course, this clashes with Pratt’s ideal life for “his” trainees. The mandatory kids-in-peril are played by Ty Simpkins (Insidious) and Nick Robinson. Much has been made of the absurdity of Ms. Howard’s numerous scenes of sprinting in high heels, and I found her overall demeanor to be every bit as exaggerated and unbelievable as her actions in heels. Jake Johnson (TV’s “New Girl) and Omar Sy (so wonderful in The Intouchables) were the most “real” characters, though neither was given much to do. Much of what is written here is “in comparison” to the original. While this may not be fair, it is inescapable when dealing with such a respected and iconic film. Youngsters unfamiliar with the original film, are likely to find this one exciting – even terrifying at times – and that’s an important distinction to make. The Mosasaurus alone is worth the price of admission … and good for a few nightmares! And who among us wouldn’t pay up for a Baby Triceratops ride in the Petting Zoo? For the Jurassic Park stalwarts, the inconsistent (sometimes great, sometimes fake-looking) CGI will be as tough to overlook as Ms. Howard’s cartoon character. And yes, composer Michael Giacchino is new to the Jurassic series, and he is wise enough to work in the terrific and familiar John Williams theme in more than one scene. However, none of the downsides will keep the true fans away, and there is an entire generation of kids who should have the chance to marvel at lifelike dinosaurs on the big screen courtesy of director Colin Trevorrow (previously known for his work on the indie gem Safety Not Guaranteed). Greetings again from the darkness. What a terrific first feature film from writer/director Ritesh Batra. Don’t mistake this for the typical Bollywood release in the U.S. There are no song and dance numbers here. Instead it’s a very intimate portrait of how two people awaken to their own situations by connecting with each other through notes in a lunchbox. “Lunchbox” takes on a life of it’s own when referring to the dabbawallahs – the infamous lunch delivery men in Mumbai. The opening credits provide us a ride-along with the key lunchbox as it takes multiple forms of transportation prior to arriving at its destination. Only this time, a rare mistake occurs. 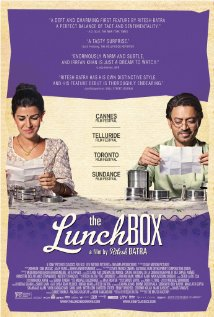 The lunchbox from Ila lands on the busy desk of Saajan, rather than her husband. See, Ila is trying to re-capture the attention of her distracted husband. Instead, she finds a soul mate in Saajan via note exchange and tasty dishes. While Ila is a desperate and frustrated housewife, Saajan is a melancholy widower who is headed to retirement in hopes that it helps him forget all that he now tries to cover up through his cigarette habit and retreat from society. The real magic here stems from the slow process of self-realization that occurs for the two characters. There is humor and emotion aplenty, yet both performances of Irrfan Khan (Saajan) and Nimrat Kaur (Ila, and her extremely expressive eyes) are remarkably understated and believable and touching. We immediately care for both. Nawazuddin Siddiqui offers support as the very interesting and entertaining Shaikh … a character that could easily support his own film. We also see Lillete Dubey as Ila’s mother. Ms. Dubey also appeared in the terrific Monsoon Wedding (2001). Equally impressive is the city view of Mumbai. The overcrowded streets, trains and buses leave us understanding how difficult daily life is for these folks. Not since Lost in Translation has a platonic relationship been so effectively told on screen. This story and these characters remind us just how important human connection is … letting someone share your dreams is a rewarding step. Greetings again from the darkness. Every now and then we are reminded of just how stunning movies can be. Periodically a filmmaker proves to us that pushing the envelope of creativity still drives some auteurs. James Cameron brought us Avatar, which demonstrated that 3D technology could be beautiful and breath-taking. As beautiful and new as Cameron’s breakthrough was, it lacked a story worthy of it advancements. Now, we get director Ang Lee’s vision of Yann Martel’s worldwide bestseller, and we are left gasping at what happens when you combine a fantastical story with technological advances and perfection. Ang Lee has provided us with a varied selection of films including Crouching Tiger, Hidden Dragon; Brokeback Mountain; and Sense and Sensibility. He refuses to be limited by genre and takes a global and philosophical view of filmmaking. He wants us to think and discuss and think some more. His Life of Pi film purposefully leaves many scenes, events and thoughts open to interpretation. You can see as much or as little of humanity in this story as you like. The brilliant opening depicts real animals in the real zoo located in Pondicherry, India. The colors, sights and sounds are dazzling and give us an immediate sense of the area and culture. We meet young Pi and his family. Pi is inquisitive and ingenious from an early age. His father imparts such wisdom as “If you believe in everything, you believe in nothing“. This comes as Pi is absorbing multiple religions and considers himself Hindu/Muslim/Christian. At an early age, he seeks answers and meaning. Events transpire and soon enough, Pi and his family take their most valued animals and board a ship to Canada to start a new life. Disaster strikes when a storm capsizes the ship and Pi (Suraj Sharma) is the lone human survivor. He finds himself in a small lifeboat with a hyena, an orangutan, and a huge Bengal tiger. Yes, that sounds like the first line of a bad joke, but here it’s the beginning of a remarkable journey. The developments need not be discussed here, but rather the focus of the story is the spirit of survival that Pi possesses. His ingenious methods of learning to coexist with the ferocious tiger force us to consider what the human race has done to nature in our attempts to gain control. Pi’s religious spirit and insightful ways, coupled with a very fortuitous and specific survival guide, lead him to maneuver 227 days adrift in the Pacific. In the process, we are treated to some of the most spectacular visuals ever seen on screen. At times the sea, and its sea life and sky, are phosphorescent. The story (screenplay by David Magee, who also wrote the underrated Finding Neverland) is so amazing that we find ourselves not caring how much is real and how much is caused by Pi’s hunger and thirst. Some of the visual effects are tranquil, while others are quite violent. A sequence featuring flying silver fish is something to behold. The structure of the story is such that an adult Pi (played by Irrfan Khan) is re-telling the tale of survival to a Canadian novelist (Rafe Spall). While this is a traditional story-telling device, it takes nothing away from the anything but traditional story of Pi and Richard Parker (the tiger’s name). We are told “This is a story that will make you believe in God“. Whether it does or it doesn’t, it certainly makes us believe in the magic of movies. Some will compare to Castaway, while others will think of 127 Hours. My best advice is to let go and give yourself to the story and the film. There is always time afterwards for debate and discussion. Instead, enjoy the moment and be thankful that a movie like this can get made … it will lead the industry to even more creative productions down the road. So, just this once, forget what I have said many times, and go see this one in 3D. Allow it to take you away. **NOTE: Suraj Sharma, who plays Pi on the lifeboat, is a remarkable first time actor. Irrfan Khan, who plays the adult Pi, is known for his excellent turns in Slumdog Millionaire and The Namesake. Greetings again from the darkness. The big debate seems to be whether it is too soon for the Spider-Man franchise to be re-booted. It was just 10 years ago when Tobey Maguire first appeared as Spidey and a mere 5 years ago when director Sam Raimi delivered the last leg in his trilogy. Obviously the reason to re-boot starts with “doll” and ends with “ars”. It is more interesting to decide if this is an improvement over the previous series. We must first look at Spider-man himself. Played here by Andrew Garfield, we get a more thoughtful Peter Parker and a more athletic Spidey version than we had with Maguire. As usual, my pet peeve is that Garfield is a 28 year old man cast as an 18 year old high school science nerd. Looking past that, Garfield manages to pull off the stunts without looking too much like a real super hero. So that’s a plus. Luckily for him, his scenes with Gwen Stacy (Emma Stone) work because Ms. Stone is such a super talent. She makes everything she is in, just a little bit better. Next we look at the villain. Rhys Ifans plays scientist Dr Curt Connors, who transforms into Lizard in the quest to regenerate growth of his lost right arm. He was once partners with Peter’s dad in their research into reptilian genetics. While Doc Ock (Alfred Molina) from Spider-Man 2 is still my favorite villain in the series, it’s clear that Lizard is certainly capable of frightening the younger viewers, so parents beware. It should also be noted that Dr Curt Connors was played by Dylan Baker in the Sam Raimi trilogy. Lastly, we look at the story. This take is much more personal and provides detail to the backstory of Peter Parker. We learn how (but not exactly why) he lost his parents (Campbell Scott and Embeth Davidtz) and see how he came to be raised by Aunt May (Sally Field) and Uncle Ben (Martin Sheen). We see how Peter and Gwen Stacy come together and learn that she is every bit his equal intellectually, if not a notch above. Casting Dennis Leary as Gwen’s Police Chief dad works as Leary and Garfield exchange barbs at the table. Peter is still a photographer, but this time for the school instead of The Daily Bugle … whose logo makes an appearance on TV. Director Marc Webb was somehow selected for this despite his only feature film being (500) Days of Summer … not exactly a film known for its CGI. Admittedly, the CGI used here is less rushed and cluttered than in previous Spidey films and many of the stunts look to be real stunts instead of the fake stuff. The closing credit cookie clearly sets up the sequel, though I can only guess that the shadowy figure is Norman Osborn. That’s still up for debate.